It's a compilation of two blocks residential flats. Land Sizes are 2702 SFTs and above. All amenities / facilities as per VGTMUDA norms. 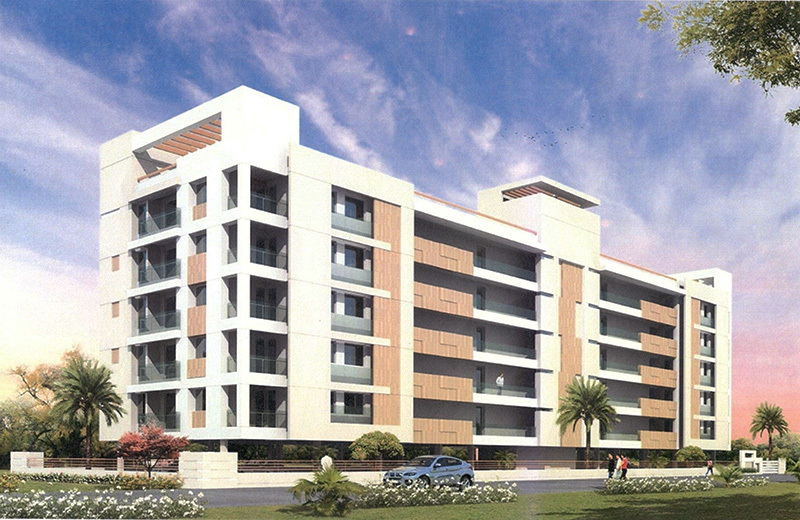 Located on very close to NH5 and other villa communities. Wide ever lasting cement roads and Italian marble tiles. D.G. Backup facility for all common areas. R.C.C. Framed Structure on footings over hard strata with plinth beams for extra safety by using Steel and Cement of reputed make. Brick Masonry with First Class moulded clay Bricks in Cement Mortar (1:6)prop. Double Coat Cement Plaster of 20 mm thick with smooth finishing. Smooth finish with luppum Altek or equivalent. Double Coat Sand faced Cement Plaster of 20 mm thick. B.T. Wood frame & Shutter aesthetically designed with melamine polishing and designer hard ware of reputed make like Archie/Haffle/Yale . B.T. Wood frame with Flush shutters/ vineer laminated/ painted and designer hardware of repupted make like Archie/Haffle/Yale. UPVC & Shutter Styles & rails with float glass paneled shutters and designer hard ware of reputed make. Wooden/UPVC windows of Premium range fitted with float glass along with provision for mosquito mesh and standard hard ware. Texture/Sandex Mat/Exterior Emulsion Paints of Asian/ICI make as per the elevation.. Smooth finish with luppum Altek or equivalent, Two coats of plastic emulsion paints over a coat of primer. Two coats of water proof cement paint over a base coat of primer. 1mX1m Vitrified Porcelain Tiles /Italian Marble with 4" wide skirting. 2'X2' Vitrified Porcelain Tiles /Marble with 4" wide skirting. 2'X2' Vitrified Porcelain Tiles with 4" wide skirting. Acid resistant Anti Skid Ceramic Tiles. Granite/Marble flooring for regular stair case. Granolithic Flooring with Smooth & Broom Finish Drive-ways with Stamp concrete / paving blocks. Glazed Ceramic Tiles of reputed make dado up to 7'0" height. Glazed Ceramic Tiles of reputed make dado up to 3'6" height. Glazed Ceramic Tiles of reputed make dado up to 2' height above kitchen platform. 1) Granite platform with Stainless steel sink with both municipal and bore water connection & provision for Aqua-guard. 2) Provision for modular kitchen. C) Hot and cold wall mixer with shower. D) Provision for geysers in all toilets. F) Shower Cubicle with glass. G) Mirrors above the wash Basins. Concealed copper wiring in conduits for lights, fan, plug and power plug points wherever necessary of Standard Make. A) Power outlets for Air Conditioners in all bedrooms . B) Power outlets for geysers in all bathrooms. C) Power plug for cooking range chimney, refrigerator, micro wave ovens, mixer / grinders in kitchen. D) Plug points for refrigerator, T.V. & Audio systems etc., wherever necessary. E) 3 phase supply for each unit and individual Meter Boards. F) Miniature Circuit breakers (MCB) & ELCB for each Distribution boards of MDS / Merlingerin make. G) All electrical fittings of Northwest/crabtree/ Legrend or equivalent make. Bore and Municipal water supply. a) Underground sump and Overhead Tank with required capacity. All car parkings in stilt level only. Automatic Lifts of reputed make /Johnson with V3F for energy Efficiency. 100% Acoustic enclosed D.G. Set. CCTV Cameras all around the Campus for surveillance. CUP BOARDS in all Bed Rooms and Kitchen.